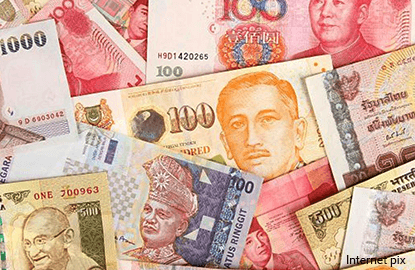 BENGALURU/SINGAPORE (March 3): Most emerging Asian currencies fell against the US dollar on Friday and were also on track for weekly losses, pressured by growing expectations for a US Federal Reserve interest rate hike this month. Leading the losses were the South Korean won and the Taiwan dollar, the two emerging Asian currencies that have seen the biggest gains against the greenback so far in 2017. The South Korean won slid more than 1% on the day. For the week, the US dollar was on track for a gain of about 2% against the won, the greenback's biggest weekly rise since January 2016. The Taiwan dollar was down 0.6% on the day against the greenback. For the week, the US dollar was up nearly 1.2% versus the Taiwan dollar, putting the greenback on track for its largest gain in over a year. Traders are buying back the US dollar, having been forced into suddenly bracing for the possibility of a US interest rate rise this month, said Satoshi Okagawa, senior global markets analyst for Sumitomo Mitsui Banking Corporation in Singapore. "There is short-covering in the dollar across the board," Okagawa said. The Philippine peso slipped below a trough hit last month and set a fresh 10-year low at 50.39 per US dollar, its weakest level since September 2006. The peso was last down 0.1% on the day at 50.38. A series of hawkish comments by Fed policymakers this week has led to a sharp increase in market expectations for the Fed to raise interest rates at its March 14-15 policy meeting, giving a lift to the greenback. Investors will be watching comments from Fed Chair Janet Yellen and Fed Vice Chair Stanley Fischer later on Friday to see whether such market expectations will be reinforced. US Treasury yields have jumped this week, with the US two-year note yield having risen to as high as 1.34%, the highest since 2009, and further narrowing the interest rate differential between emerging Asian countries and the United States. Such rises in US yields can erode the relative attractiveness of seeking higher yields in emerging market countries, and lead to concerns about potential capital outflows. "There will be expectations for rate hikes over the next 12 months in Asia," said Saktiandi Supaat, Head of FX Research at Maybank in Singapore. "Some of the Asian countries may not see too much of an impact in terms of outflows. We need to see the pace of the US rate hike over the next six months before we figure it out." The foreign fund flows in Asian markets have remained strong so far this year on the back of strong economic data in the region. Strong GDP growth last year in Asian countries, such as China and South Korea, has painted a positive picture about the region's economy for 2017. "I don't think we can say yet that we're headed for a phase of capital outflows and across-the-board weakness in Asian currencies," said Masashi Murata, currency strategist at Brown Brothers Harriman in Tokyo. "Even if there is a (Fed) rate hike in March, it's unclear whether it can keep raising interest rates steadily in June and September." It could be difficult for the US dollar to keep rising further unless the market gets more specifics from US President Donald Trump on his plans for tax cuts and infrastructure spending, Murata added.